Merlin emerged from his tree - but he wasn’t what viewers anticipated... Emma took a heart from someone unexpected ... and then she broke another while Merida found just the right tool to force Rumplestiltskin to be brave in Once Upon a Time Season 5 Episode 5. 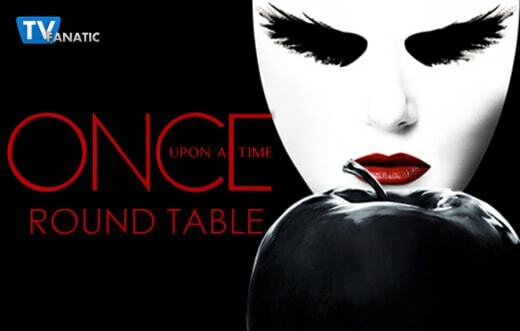 Below, TV Fanatics Jim Garner, Christine Laskodi and Allison Nichols are joined by Gareth from Once Upon a Fan to debate the new face of Merlin, Henry’s broken heart and whether Emma has an alternate plan after “Dreamcatchers." Was Merlin what your were expecting and what do you think of this version of the character? Jim: Like David/Charming I was expecting "older" Merlin. Beyond that, I like this version, I hope we get to learn more about why he was stuck in a tree and even more importantly, where is he now? If everyone else came back to Storybrooke (including Merida) where is Merlin? Christine L.: I really liked this version of Merlin, and I look forward to seeing him more. Just like Jim, I also want to know more about that tree and that opening scene, and where he is now. I'm wondering what happened between he and Emma that somehow ended up in her becoming the Dark One. Gareth: I felt a bit underwhelmed by him to be honest. He’s had a big build up from last season and I just felt he lacked the gravitas required for Merlin. It is early days so I will give him a chance but I feel the actor who played the Apprentice last season would have made a far better Merlin. I know the show likes to switch things around but I don’t feel it worked in this instance. Right actors, wrong roles! Allison: I'm still waiting to be in awe of him. Right now, I don't feel impressed by his superior magic. I'm hoping to get some great scenes between him and Emma. I would love to see the two of them talk magic. Were you shocked that Emma purposefully broke Henry’s heart even while she was supposedly still trying to fight against becoming the Dark One? Jim: Not shocked at all, I understood it completely, she knew she needed a real tear of a fresh heartbreak. I'm sure her plan involved helping Henry win the girl back even if they hadn't lost their memories. But seriously, the kids are 13, minus the heart removal, how many teenagers get told to dump someone by their parents. Christine L.: I had a feeling that was where the story was headed when Regina re-told the story of Daniel (and any excuse to see Barbara Hershey makes me happy!) I do believe Emma when she says that she did what was best for Henry. I'd like to believe that he's her "anchor" into reality, the way that Belle was for Rumple. Still a sad move on her part though. Hasn't Henry been through enough? Gareth: Even as the Dark One, I have a tough time believing Emma would do that to Henry, but for the purpose of the plot, it worked really well. I guess she did it for the greater good. Poor Henry though, he will be holed up in his bedroom playing “Only You” for years at this rate. Allison: I definitely was, but it was a great way to show how the darkness already has a hold on her. Emma is doing things for, what she believes, is the right reason. In order to free herself from the darkness. She needs to free Merlin and heartbreak is the only way to get there. I like how we are slowly seeing how the darkness is affecting her in Camelot. Do you believe Emma’s plan is to get rid of all of the dark magic or the light magic once she reunites Excalibur with the Dark One dagger? Jim: I honestly have no idea what Emma's end game is. Given we now know Merlin was freed and offered to release Emma "if she was ready", I'm baffled at what went wrong along the way. Christine L.: Emma's endgame could be anything, really. This is the first time in her life where she really gets to be selfishly bad, so she might take the chance to cause some havoc. I am a sucker for a cheesy ending though, so I'm hoping that the light side of Emma is still in there, and has a plan to vanquish the Dark and is calling the shots. That seems like a very "Emma" thing that would happen. Gareth: I still think Emma is playing a long con and is acting behind the scenes in everybody’s best interests. Her methods may be a bit cruel but I think she is still fighting inside to save herself. Where is Merlin? I think he might be the one to watch for dubious motives rather than Dark Swan. Allison: I agree with Gareth. I think Emma is doing what is best, but like with taking Violet's heart, she is giving into the darkness to help her achieve that goal. If ridding the world of dark magic is her game plan all along, then it would help to explain why she took everyone's memories. It could all be a rouse, or maybe Emma wants everyone distracted in case someone (maybe shady Arthur) doesn't want dark magic to be gone forever. Maybe Emma knew in Camelot that she would have to give into the Darkness in order to rid the world of dark magic. I'm still holding out hope for Emma. Once Upon a Time Photos: "Dreamcatcher"
Was there anything in “Dreamcatchers” that disappointed you? Jim: I was a little disappointed in the "sand" working on Snow/Charming. While Arthur and Gwen were in a broken marriage and that qualifies for the sand to work, there was nothing really broken about about Snow/Charming learning the truth. Seems like a stretch on the "make something broken seem whole" portion of that sand. Christine L.: I'm totally with Jim on this one. I wanted a little more resolution from the sand story. Now that they know what Arthur did, shouldn't they be able to figure it all out? Maybe we'll hear more on that next week? I can't see it dropped that quickly. Gareth: Like I said, Merlin disappointed me. Big buildup but he didn’t really deliver for me. Besides that, it was a pretty solid episode. Allison: We got a moment where Regina stated that she believed that everything Emma has done as the Dark One was for a good reason, at least in Emma's mind. Where was this sort of trust in the Dark One before this episode? I would have loved to see more of Regina holding onto hope that Emma isn't completely gone. 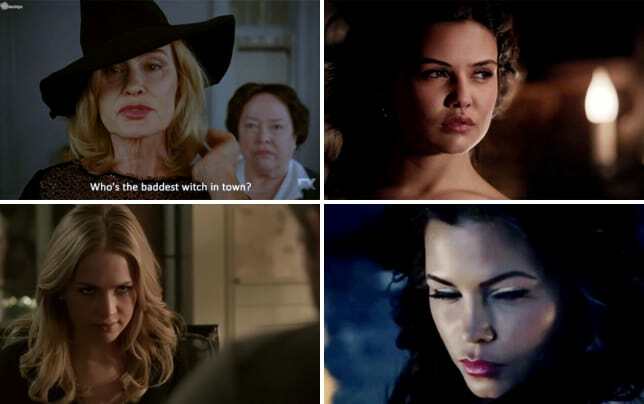 Regina talking to Emma as the Dark One and almost being friendly would have be amazing. Jim: I really enjoyed Merida teaching Gold to be brave. The actress has really nailed an Older-wiser Merida and her using the teacup as a taunt to get him thinking about someone other than his limp was a bold move. Christine L.: I really liked the moment when Henry poured the Pepsi, and Violet asked him if it was magic. Something about that moment made me feel like a kid watching a Pepsi ad during Saturday morning cartoons. Gareth: The scenes with Emma and Regina. Regina totally Miss Swanned her! I loved it. This episode had a great Once Upon a Time Season 1 vibe between them again. Allison: I really loved seeing Operation Cobra again. I miss Henry and Emma being partners in a secret mission. I want to see more of that, although it doesn't look like it is going to happen for a long time. 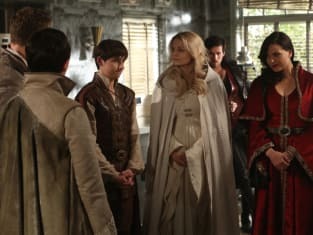 Check back in on Sunday for our review of Once Upon a Time Season 5 Episode 6 and if you can’t wait until then for more magic, you can watch Once Upon A Time online here at TV Fanatic. Show me that the mom I know is in there somewhere. Permalink: Show me that the mom I know is in there somewhere. Put it away, Arthur. We both know that broken sword can't hurt me. Permalink: Put it away, Arthur. We both know that broken sword can't hurt me.